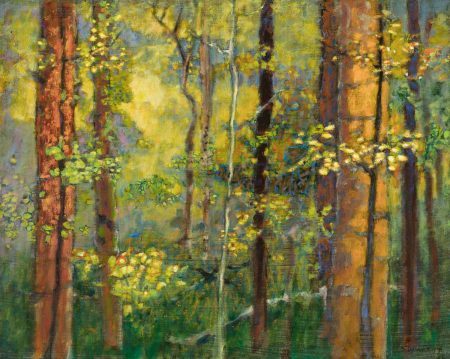 The Miller Gallery in Hyde Park closes a wonderful landscape show on September 29, 2017. The work of three artists is included in the show, though the work of Santa Fe artist Rich Stevens dominates; the other work is complementary to Stevens’, but overall, the paintings on display all have something of an Asian influence in the work. Each approaches landscape from different perspectives, and each artist’s work, in his or her way, is mostly successful. Rich Stevens’ work shimmers in front of the viewer. His paintings feel like contemporary versions of Japanese screens, with natural elements forefronted, so that the spaces are shallow, luring the viewer in. Large tree trunks dominate Stevens’ compositions, and although each painting has one central trunk, it’s seen as a section from the middle of the tree, and these trunks are the structuring devices for Stevens’ works. Dancing across his compositions, the trunks seem to sway in a mild breeze, and draw the viewer’s eye across the mostly very horizontal paintings. 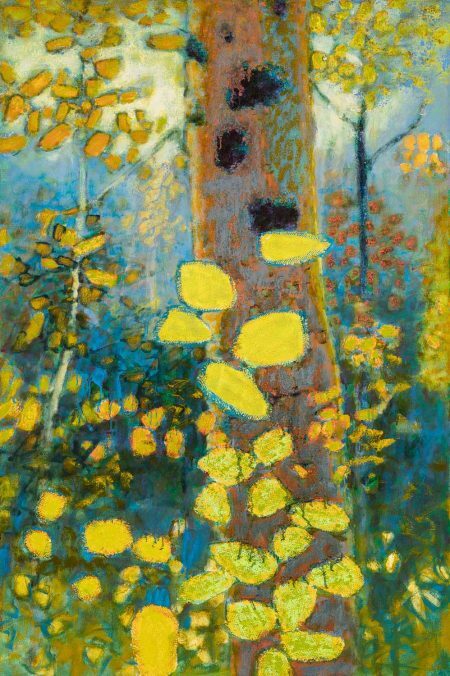 Favoring the autumn season, because of the wonderful color of autumn leaves, Stevens paints falling leaves that are hugely overscaled, in wonderful chartreuses, yellow-browns, oranges. These leaves remind the viewer of mosaics and/or glass, and are the main compositional element that create the shimmering effect mentioned above. They are also pushed forward into the frontal picture plane in each of his canvases in which these elements occur; it’s as if Stevens uses the foreground twice, a little mid ground, and almost no background. They thus give the viewer the illusion of wandering into these tame forests; it’s almost as if we feel these leaves falling gently about our persons. These huge overscaled leaves are Stevens’ cleverest painterly trope, as they enhance the sense of the viewer being welcomed into a magical forest. And the overscaling of the leaves and of the central tree trunks create fascinating illusionary space; the paintings veer closely into flatness, as in Japanese screens, but the leaves create movement, along with the other swaying trunks in most of the canvases on display. Stevens’ views of nature/forests remind me of something a friend once said to me about nature: “I have a city boy’s love of nature, like going to parks”, and Stevens’ nature is tamed, beautiful, without bugs or animals or bad weather. They have a mesmerizing effect on the viewer. Stevens varies the scale of his paintings, from small to large, and his most successful works are the large horizontal paintings, as they breathe, and imply a kind of infinite space if the eye could keep wandering outside the picture plane. And because the giant falling leaves are painted with such bright colors, they bring the work of the Viennese painter Gustave Klimt to mind, who also uses color (particularly gold) to create the same shimmering effect as in Stevens’ work. And Stevens cleverly and successfully combines the attributes of Art Nouveau/The Viennese Succession with the elements of Japanese screens mentioned above. It’s a fascinating combination, and works highly successfully in his work. (The word “decorative”, in Japanese painting, is the highest form of praise one can offer, as the Japanese radically condense and limit visual information, letting key elements– a crane, an iris–stand in for all of Nature, and Stevens accomplishes a similar effect). Steven’s backgrounds are more implied than delineated; he is seeking the shallow space of foregrounds, so we don’t feel we’re wandering into the woods, lost to the world. Tame forest scenes perfectly fit the city person’s idea of nature. 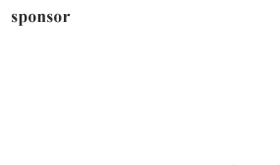 Stevens’ abstract paintings are less interesting and less successful. Ellen Diamond’s large paintings are the transition paintings between the large front gallery at Miller, where Stevens’ work is displayed, and her work does complement Stevens’. Her two large horizontal scenes of a creek, one in late winter, and the other in early spring, are loosely painted: she’s clearly learned many lessons from Abstract Expressionism. Her brushstrokes are very gestural, often painted in parallel strokes, so that a stroke of green is painted adjacent to a stroke of purple, implying both shadows and light as well as movement; her strokes are nearly agitated as they imply all the lush, living elements in or adjacent to a creek as the seasons change. One feels all sorts of natural elements coming to life after winter in her work; her palette, in particular, is impressive and successful. Diamond’s brushwork implies the wildness of nature, just as Stevens’ implies the opposite. Diamond’s large paintings of Italian villages seen from afar, where she focuses on the abstract brushwork of hills leading up to the village, are less interesting, if effectively painted. Ned Evans’ paintings, often in mixed media including graphite, charcoal, pastel and spray paint, are enormously successful and a great find for Miller. All but one were sold by the time I got to the gallery, about two weeks after the show opened. All the paintings are clearly based upon both Chinese and Japanese painting, though I wondered whether the artist was also influenced by some of de Kooning’s work, particularly The Amagansett series of prints. All the paintings are in gradations of black, greys, whites. The best of his compositions tend to the asymmetrical, and the bold simplicity of Evans’s style again reminds us of the same elements in classic Japanese and Chinese paintings. 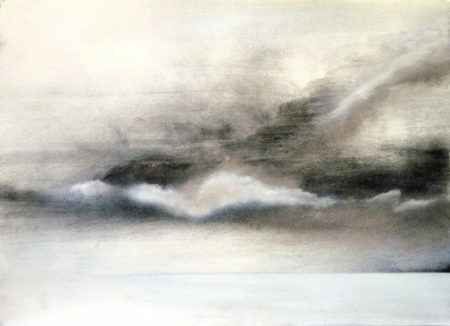 They most parallel Japanese sumi paintings, and are reminiscent of Zen Japanese painting, where the brush never leaves the ground on which painting takes place, and elements of nature are reduced to their simplest emanations. 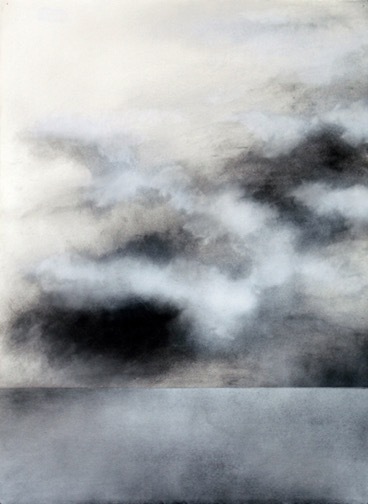 In Western terms, Evans’ paintings are both minimalist and reductivist, as he interprets elements of nature, most often sky, clouds, and water. Evan’s compositions are fascinating and seemingly elemental, and they are a wonderful surprise in this show. The show’s main focus is on Rich Stevens’ work, and it’s both a delight to see and to interpret. They are, in short, beautiful, as are Diamond’s creek paintings and all the work of Ned Evans. This landscape show at Miller Gallery is a big success.